This is the third and final instalment of our Matariki resource for 2016. In Parts 1 and 2, we introduced the Matariki tradition of kōrero pūrākau (storytelling), and showed how to use creative movement or dance as a meaningful and accessible storytelling medium. 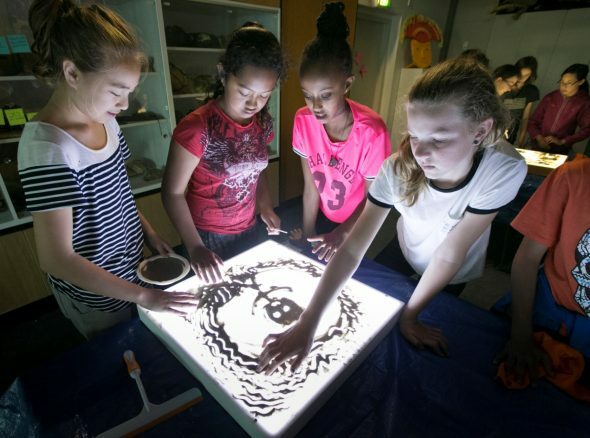 In this section, we’ll demonstrate how to share stories through a very different medium: sand art. 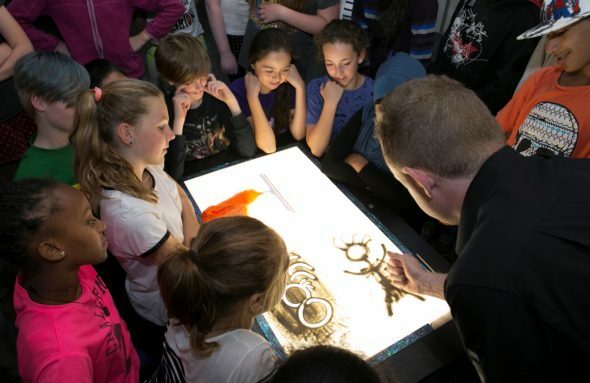 This resource helps you access elements of Te Papa’s Matariki education programmes, no matter where you are in New Zealand. 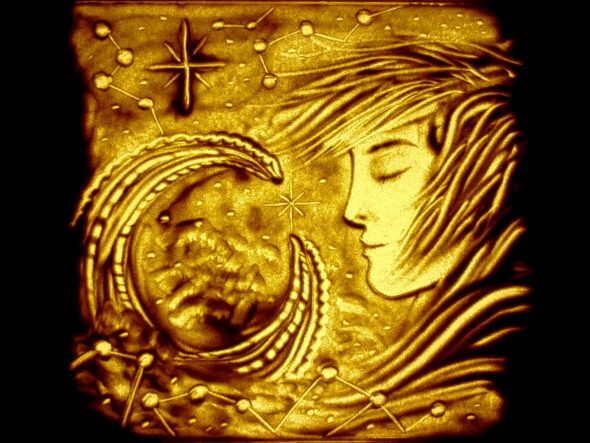 Sand art, or sand animation, is a visual art form in which artists use fine sand to create pictures on the surface of a light box. It was invented in 1968, and has gained more popularity recently thanks to performance artists such as New Zealand’s own Marcus Winter, and the winner of Ukraine’s Got Talent, Kseniya Simonova. Sand art’s tactile nature, immediacy, and simplicity of use make it a great medium for learners of all ages. You can also broaden students’ experiences by introducing narration, musical accompaniment, photography, and filming to the learning process. You’ll need at least one light box. You can either make your own (check out the range of online instructables on YouTube) or purchase them from suppliers, such as Waikato-based Light Box Sales. You can either collect sand or purchase it from hardware stores. We recommend you sieve your sand, regardless of origin, to make it finer and to remove impurities. Drop sheets or tarpaulins will help you contain sand spillage. Children need time for free play when starting out with sand art. 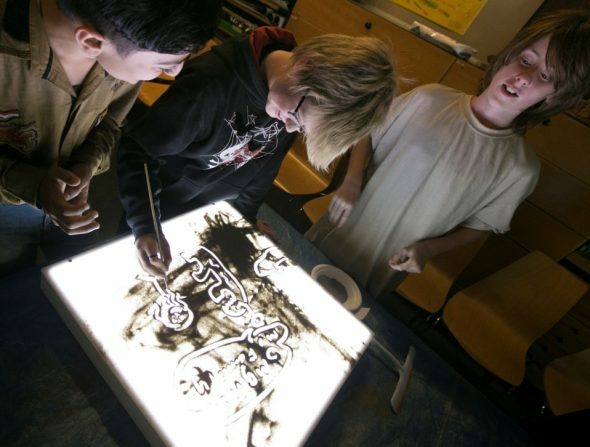 This allows them to explore the medium and learn how to express themselves through it. You can help them by teaching the basic sand art techniques, some of which are described below. Sand artists, like printmakers, use positive and negative space in their compositions. 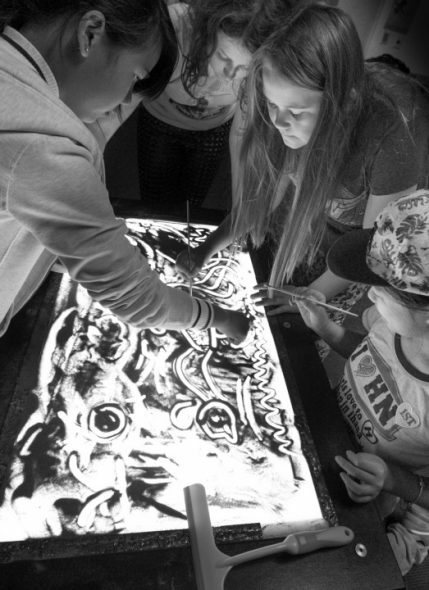 When you draw by putting sand on the light box, you’re using positive space. When you move sand away to make pictures using the light underneath, you’re using negative space. Contrast adds visual interest and drama. You can use contrasting positive and negative space, or large and small shapes, such as a large face next to the small details of a landscape (as featured in Marcus Winter’s Moe Hurihuri – Restless Sleep). You can also explore contrasts in texture, shape, and pattern. A distinctive feature of sand art is that it allows artists to transform pictures over time, making interesting transitions between frames, much like in animation. 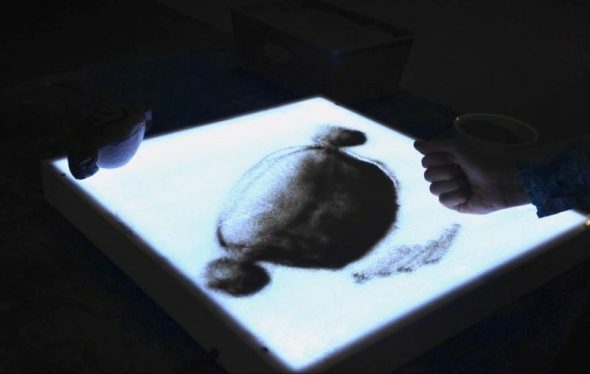 This aspect is often what makes sand art performances so engaging for viewers. Students can experiment as they draw, adding new images and, with a bit of planning, transforming one picture into another. Erasing can play a part in this. 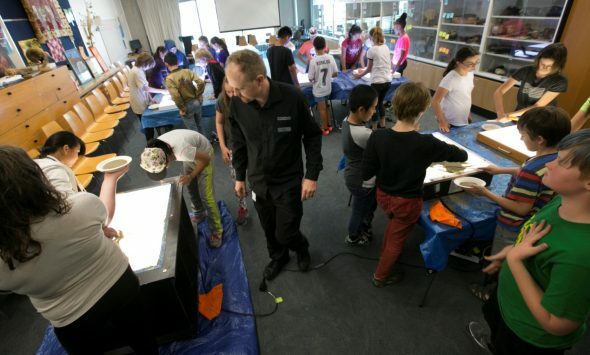 In this short video, Te Papa Educators explore adding dynamics to their sand art (from 0.50sec point), along with other techniques. For further inspiration, watch videos of live professional sand art performances online. The use of tone in sand pictures offers a challenging yet exciting extension for more capable students. It requires fine control over the application of sand to create striking effects including a 3-D feel. Children should experiment with the technique before applying it. Tonal exercises are a good place to start, such as creating a simple gradient from lighter to darker. When we created our Matariki programme Ngā Tapuwae Onepū | Footsteps in the Sand, we focused on sand art as a way to create and express story. In the programme, we view Marcus Winter’s Moe Hurihuri – Restless Sleep, developed for Te Papa’s exhibition Whiti Te Rā! The story of Ngāti Toa Rangatira. This demonstrates some of the possibilities sand art offers as an art form and a storytelling tool. The video tells the story of Te Ua Tōrikiriki, daughter of chief Nohorua. When Te Ua was abandoned by her husband, the English whaler Joseph Thoms, she stood on the hill behind Pukerua Bay, broken-hearted and singing into the wind as his boat departed. The song you hear playing was composed by Te Ua at that moment. Next, our educator demonstrates the key sand art techniques (outlined above), making references back to Moe Hurihuri. The children break into small groups of two to five to practise these new techniques and explore the medium. Coming back together, the tamariki pass around a waka huia (treasure box), and are asked to think about the taonga it may hold – remembering that taonga don’t need to be worth a lot of money, or be physical objects. Memories, relationships, and hopes and dreams for the future are also significant taonga. 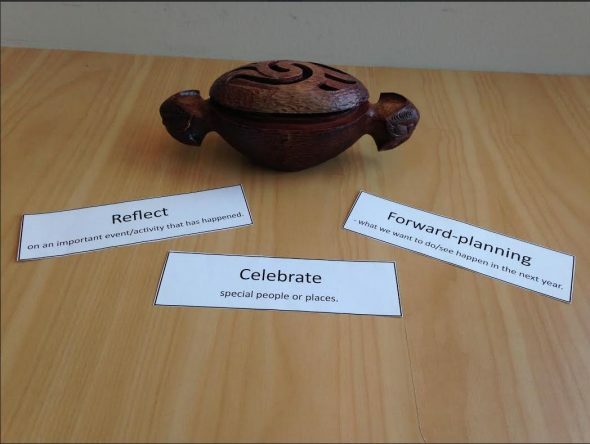 With this in mind, the students are asked to co-create a Matariki story to share within their small groups. They select one of three renewal themes: reflection, celebration, or forward planning (see Part 1 for more details). Each child is encouraged to create their own part of the story in blocks of three to five minutes, and to narrate it to their small group. Another option could be for the group members to work together on each part. Children and teachers use their own devices to capture their stories as video footage or photographs. They can take these back to school for further extension. The photos below show some of the sand art kōrero pūrākau (storytelling) undertaken by the Takahe class (Year 8) from Mount Cook School. Explore ways to record your students’ performances with these simple ideas for filming and photography. Videos and photos can be edited together using simple programs such as Microsoft Moviemaker (PC) or iMovie (Mac). You could also try apps such as Flipagram, Halftone 2, and Vyclone. This trial video was made using Moviemaker with footage filmed via iPhone taken during a sand art session with the Katipo class (Years 6 and 7) from Mount Cook School. Enhance video stories by adding narration or music that ties in with Māori storytelling traditions. Music also enhances story by creating mood and effect. Students could use song (as in this video by Ridgway School), instrumental music, body percussion, or ‘found sound’ – where sounds are created from everyday objects such as pencils tapping, paper crumpling, and rulers twanging. 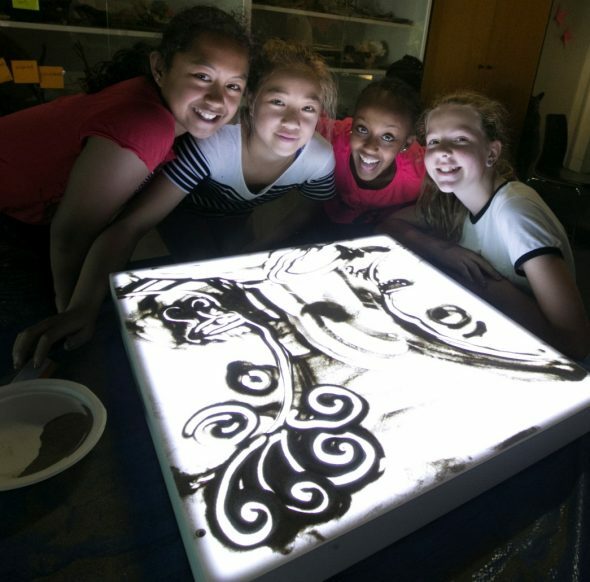 Celebrate Matariki with your wider community by sharing your sand art videos with them, perhaps via your school’s website or YouTube channel. Thank you to Mount Cook School and Ridgway School for your support with this part of our Matariki education resource. Thankyou for this wonderful resource. On a wall in our Big Ted Playschool room we are creating a space where whanau, including kaiako can bring a photo of something that is considered taonga to their families to place together. We have been looking at how we can respectfully define taonga, Maybe it is land, a holiday spot, a food, music, poetry, a cultural costume, a spiritual or religious symbol, a story. We are reflecting on how we might welcome and invite our whanau be part of this experience. As you say memories, relationships, hopes and dreams for the future are significant and I am mindful that we will find a way to invite these special contributions also. Thankyou for these beautiful resources…I think versions of these activities are likely to turn up in Auckland Libraries? Will have to wait and see.